Day 1 of another Digital Dozen week. This is going to be a tough one for me, as I'm not really able to get to polish my nails as often as I used us with this broken ankle. But it's a fun prompt - Colour Contrast! Usually I'm fully prepared with all five manis ready to post at the beginning of the week. Not this time unfortunately. I've got one more done but I will have to try get another design done today. For my first design I've gone with something pretty simple using dotting tools and nail vinyls, but it's all about the colours right. I used two Pipe Dream polishes for this. VIP Pass and Happy Hour from the A Night In Vegas Collection. I guess I should have used a brighter green polish to make this strictly a full colour contrast, but I really liked these two colours together when I had the bottles next to each other. What I really loved about this was how quick it was to do, as long as you wait for your base colour to dry enough, vinyls are so easy to use. I definitely consider this one beginners nail art, so I should probably lift my game for my next manis! 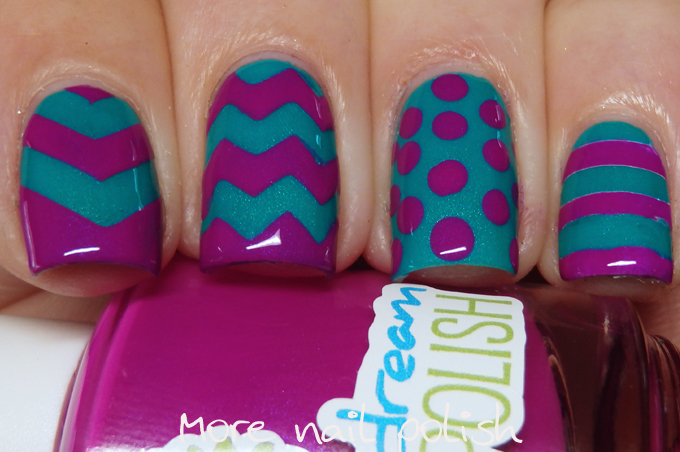 These two colors together really work well - I love the fun designs too! :) I hope your ankle is doing better! This is so pretty! The colors work so well together. I hope you're feeling better too! I love this - great colour combo!